Hand-wired frame with antiqued gold leaf finish. 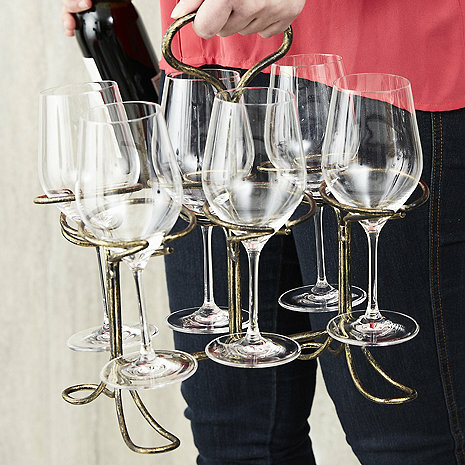 At last, a worry free wine glass caddy to safely and easily carry up to 6 glasses in one hand. No more balancing act as you bring your wine glasses from kitchen to table. Also makes for a quick and easy cleanup at the end of the night. Hand-wired frame with antiqued gold leaf finish. Very useful and works very well with both large bowl pinot noir and slender champagne glasses. Glad I purchased the caddy. I used it a couple times outdoor for my wine bar, and it truly works! great quality and sturdy, it hold all types of wine glasses, we are happy with it! Love it so much that we bought 5 more for Christmas gifts! Very sturdy, looks just like the picture, even nicer. Sure beats trying to balance wine glasses on a tray to bring out to the deck! Great idea when serving guests on the patio and saves trips to get more glasses. Bought these on a whim (OK...two glasses of Pinot too many) Anyhow...Someone put a lot of thought and work into this little caddy. The damn thing handles the main Riedel line - Burgundy all the way down to the champagne flutes like they were designed for one another. Being Cinco De Mayo..it will even handles marg glasses 4 at a time (vs 6 wine). A nice little touch for dining al fresco...A great Christmas gift for fellow wine lovers. Very nice. Looks good and very handy. Arrived promptly. We love this wine caddy. It holds the glasses straight up and securely and is great for carrying your wine bottle and glasses outside to the patio! Simple and stylish and just what is needed to transport 3-6 wineglasses from say the kitchen to the patio, as I do. That is unless you are either a juggler or possess the attributes of an octopus. great product to carry wine glasses safely!!!! great product to carry wine glassed safely. I would recommend this, very well made. Short and sweet!! Very classy looking and carry both large, small, flutes, etc. I'm very glad I bought!!! It’s ok. No big deal with this carrier. Can’t see why the big fuss wine enthusiast makes about it. Our son in law considers the caddy a “work of art” inside his beautiful wine room. I observed him carrying wine from that room to his patio which is a distance; so, the caddy is great for that purpose. I wish it were more grey colored and less brass color. But, he likes it! !